Change happens all the time and while it usually upsets us humans very little, for dogs new things can be very distressing. Maybe you’ve recently moved house or had a baby, or perhaps everyone is grieving the loss of a loved one. Out of the blue, your usually rambunctious dog is sad and withdrawn. No matter how hard you try, there is no way of bringing him round. 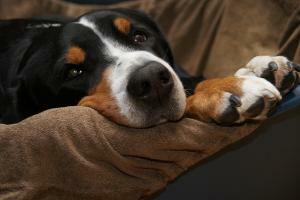 Could your dog be depressed? Experts say yes. Dogs can be easily upset by changes in their environment and this can last a matter of days, or in extreme cases, a number of weeks. If your dog becomes depressed they may be lethargic or disinterested, and may even stop eating and drinking altogether. Unless this is nipped in the bud quickly, your pooch may suffer a slow decline. However, before you self-diagnose your dog’s depression, it is worth getting him examined by your vet to rule out other things. There may be a medical reason why your dog is acting off and it is important to rule out everything. If your vet finds no physical abnormalities then he might consider depression as a cause. A diagnosis of depression might come as a complete surprise to you, or it may make perfect sense. If there has been an obvious change in your household i.e. a new baby, building work, or a death in the family, your dog’s depression is likely to be a consequence of this. Sometimes a change to the normal routine or a transference of attention from one thing (your dog) to another thing (your new home/baby/partner) can manifest as depression. The weather is another factor that can influence your pet's mood and behaviours, just as it can ours. SAD (Seasonal Affective Disorder) is a condition that affects many of us to some extent during the darker winter months. As we move from summer to autumn and winter, your dog's mood is also likely to change. Like with humans, some dogs are more susceptible to seasonal depression than others. It may be that reduced sunlight hours and more rain means their exercise routine has changed and they are being walked far less than before. Dogs that are depressed because of SAD are likely to exhibit withdrawal, lethargy, and a craving for food. If your dog exhibits any symptoms or behaviours out of the norm, it is important to have him examined by a vet. Observe your canine throughout the day, paying particular attention to his basic habits such as playing and eating. If your dog's disposition towards people and other house pets was once friendly and playful and has suddenly grown detached and disinterested, depression may be the cause. Likewise, if your dog suddenly eats less than he did before it is possible he is experiencing some sort of physical or mental distress. Sometimes a visible cause can be found under close inspection i.e. a physical injury or a tooth problem may prompt lethargy and depression if it has not been treated. Similarly, diseases such as Lyme Disease can cause depressive tendencies, while an infectious condition could also be at play. The symptoms of hormonal imbalances like hyperthyroidism are also very similar to those of depression. So, how do I combat my dog's depression? Perhaps the most obvious advice is to keep your dog active and engaged in 'happy' exercises at home. However sometimes, particularly if your dog is well in the throws of depression, improving your dog's mood yourself is a more difficult task. If your vet suspects severe depression, he may prescribe medication to help boost your dog's mood and get him back on track. A behavioural therapist may also be recommended to re-condition your dog and have him overcoming his anxieties. While showering your dog with affection is tempting and very often our immediate response to a companion's show of melancholy, this can actually be detrimental to his recovery. Rewarding depressed behaviours with excessive displays of love and attention may encourage your dog to continue behaving this way. That is not to say you should ignore your dog, but you should try to act as normally as possible to reassure your dog that one area of change doesn't have to mean complete change. A few years ago our westie male became very withdrawn after we moved home and he wasn't allowed in to the garden at the new house as it wasn't suitable for him.We just gave him extra walks to make up for the time out of the garden so his exercise was as near to his previous levels as possible and kept his obedience exercise's ongoing , it wasn't too long before we had the old dog back , we did move home again and we were worried that it would happen again but he was just fine. A few years ago I changed my old light fittings for the modern fittings with halogen bulbs. I noticed that the lighting seemed very dull and I felt my mood was lower than usual (but not depressed). Every winter after that I felt the same. I also noticed that one of my dogs seemed a bit depressed in the winter months and could not be bothered to even play anymore, although she was her usual self in the summer months. Last year I changed back to flourescent lights in my kitchen and also changed to daylight (bright white) bulbs in some of my other light fittings. Over last winter I felt ok and noticed that my dog was also happier. I believe she was suffering from SAD because the lighting was so dull. Last year, we had to have our Lab put to sleep. We knew his time was limited, but, when he suddenly took a turn for the worse, we had to rush him to the vet to be put out of his misery. What we didn't think of was his life-long (though not always appreciated) companion - our German Shepherd. When we returned home, obviously devastated at having lost our Lab, we realised our mistake. We greeted our GSD as normal. She then went to the back door, stared at it, cocked her head, looked at us, then off to the window to check - but, of course, no sign of her "other half". How I cursed myself for not preparing her. For weeks she looked for him. She was completely deflated, and, even now, is not her old self. She was the boss, and now seems to have lost her "raison d'etre", though is coming to terms with it. But she still doesn't like anyone sitting in her partner's battered old chair!